Each attendee is required to pack along a personal hygiene kit. 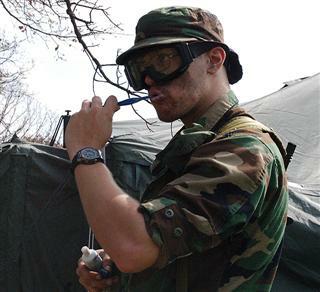 Personal hygiene in the field is important both for the sake of comfort as well as protection from disease. Wet Wipes/baby wipes. Without shower facilities, Wet Wipes are the most popular way to stay clean in the field. These are available at most grocery and drug stores in both normal and travel packs. Bring plenty, you will use them. Alcohol Wipes. One step up from Wet Wipes this are similarly sized moist towelettes that are saturated with alcohol. They are a more aggressive cleaner in addition to being very antiseptic. These do not leave much residue behind and excel for cleaning feet. They are available at many drug stores as well as Office Depot. Wash cloth and towel. Frequently, you can find period and nationality correct wash cloths and towels but even if you cannot just about any will do. Fairly small towels will do the job, we are not going to the beach here. All other factors being equal, shoot for an earth toned color since if it isn't it will be by the end of the week anyhow. Sunscreen. East Wind is outdoors after all. If you are prone to burning, pack some sunscreen along. Single use pre-pasted tooth brushes. These are handy if you are going to be out on patrol for a while. You can generally find these in the with the travel size stuff at drug stores. Foot/body powder. Foot/body powder such as Gold Bond or Desenex can be helpful for keeping feet dry as well as for dealing with minor chafing issues. Zinc Oxide Cream is helpful both as an immediate fix for chafing as well as a for use as a sunblock in the event that you are finding yourself dealing with sunburn issues. Travel sized shampoo and soap. Depending on weather conditions we may be able to open up a shower house at the end of the event and get a shower in before hitting the road for home. if that happens, you'll be glad you had soap and shampoo. Sharp fingernail clippers and a good nail file. Your fingernails and toenails are going to take a beating out there so if you are prone to splitting nails, hangnails or ingrown toe nails, you will be glad you brought along a good quality set of clippers and a sharp nail file. This page was last modified on 13 September 2013, at 10:16.